To start January with good news: well done the Czechs! I have just returned from the Czech Republic and the police there have done something almost unparalleled in the match-fixing world. They have swooped in and arrested 25 people and busted up an alleged match-fixing ring in the lower divisions of their football league. In football that happens just about every week: police come busting in and arrest loads of players, coaches and referees. Ahhh, yes; but this is different! The Czech police have arrested officials. Genuine officials. Not some hapless referees or coaches, but team owners and league administrators. Some of the arrested officials may be innocent: but it is at this level of people where the problem of sports corruption is the worst. The Czech investigation has two general implications. First, it shows up these ridiculous ‘education’ program sponsored by FIFA and laid-on by consultants and former cops. How ‘FIFA-sponsored ethics courses’ could ever have been taken seriously is beyond me. What you have often had is the spectacle of law-abiding players being ‘educated’ on why they should not deliberately lose matches while some of the officials who orderthem to fix the games stand around and look serious at the back of the room. Oh please. If the academics who did this kind of work could ever get out of a conference hall they would discover that they have been fooled by sports officials. These officials want to hide exactly what the Czech police have allegedly shown: match-fixing is often directed by sports officials. The very level of people who are telling the academics whoppers like the police do not take match-fixing seriously (60 national police investigations around the world and counting) or that there is not enough legislation to stop it. It is difficult to overstate the corruption in Turkish football. It is even more difficult to overstate the twisting and turning by various officials to excuse the former Fenerbahçe official Aziz Yildrim of his conviction for match-fixing. To review: in July 2011, Yildrim was arrested, along with 90+ other people connected to football in Turkey. Many of them were successfully convicted (please take note academics). The evidence was long and copious. Hours of taped phone conversations where Yildrim and other officials rigged the transfer market, arranged for sympathetic referees and bought/sold matches. His conviction was upheld in several trials. UEFA also stepped in and ensured that Fenerbahçe and Beşiktaşwere banned from European football. Their decision was reviewed and then upheld by the Court of Arbitration for Sport (the effective Supreme Court of sporting law). However, because of the popularity of Fenerbahçe and the various machinations of Turkey’s politicians there has been tremendous push-back against these convictions: legislation has been repealed, a Presidential veto over-turned, the Turkish Football Federation was replaced and now Yildrim is back on trial in Istanbul. What Yildrim has managed to do is put Turkey’s entire legal system on trial. He is claiming that all of his troubles and the hours of taped conversations were faked by supporters of an Islamic scholar-turned-politician living in Pennsylvania. The essential point for outsiders is – if you were a police officer would you want to deal with all these attacks or would confine yourself to arresting the hapless players and low-ranking referees? Understand the answer to these questions and you understand what many Asian countries have been doing for years and why match-fixing is so rife on that continent. Below is a recent interview from the Malta Times written by the very good Kevin Azzopardi. These are some of the words that are widely used to describe match-fixing and its devastating effects with Michel Platini, the president of UEFA, declaring that the problem was “crushing the soul of football”. 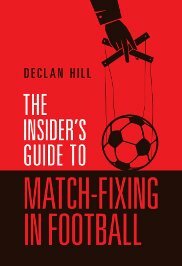 Declan Hill is neither a football official nor a police officer but his investigative journalism has shed a compelling light on the motives and methods of the gangs that pull the strings in the match-fixing underworld. This is a guy who has come face to face with one of the most notorious Asian match-fixers who, as they spoke, rigged football games in several countries. “Football and sport have given me some of the most beautiful moments of my life, some great moments of friendship, beauty and competitive spirit,” Hill told Times of Malta. “And to see the threat that modern-day sport is under… football is now in an existential crisis. “In other words, if we don’t solve this problem of match-fixing, it’s over. It’s not going to be over this Sunday but in the next five to 10 years you’re going to see what’s happening in Bulgaria happen in Malta where the crowds would dwindle, the sponsorships would go. Football has been shaken by a series of match-fixing scandals in the last decade. A few years back, the Bochum police unearthed a network of corruption that they believe may have been responsible for manipulating as many as 300 matches across Europe, including Malta’s Euro 2008 qualifier against Norway which led to former international midfielder Kevin Sammut being banned for 10 years. Hill lauded the police for their sterling work but bemoaned the response from the authorities. “I just don’t think, I’m sure it is the tip of the iceberg. I believe that, in most cases, police have done fantastic work,” Hill said. “Everything that we know about this match-fixing world comes from Bochum, it comes from a number of police investigations around the world. “I’ve had the good fortune of uncovering a match-fixing ring in Asia. “They were arrested, some of the guys were arrested in Finland and convicted, so that stuff is coming out. The court cases are coming out. FIFA and UEFA have long advocated a zero-tolerance approach to match-fixing while governments have, on countless occasions, pledged to beef up their fight against corruption in sport but Hill has clearly not been impressed. “I think much of their efforts are shadow puppet theatre,” he claimed. “They are dancing around… I’m not trying to say that they are crooks but they simply will not take this seriously. It’s a really big act that they’re doing. “Look, here’s the headline for your readers. “We know who most of the fixers are, we know their photos, we know where they live, we know what they’ve done and, consistently, they have either not been arrested or currently a number of them have been arrested but they’re put in detention and they’re never put on trial. “If you put those guys on trial, European football would have a major shock because they would talk about football associations corrupting, they would talk about teams corrupting, they would talk about famous players and famous coaches corrupting,” Hill added. Given that the majority of the players are not full-time professionals and the clubs are bedeviled by financial problems, it is generally assumed that Maltese football is easy prey for match fixers. “I’ve seen fixed games at almost every level of football,” Hill remarked. “The key is not how much you pay the player, it is whether you pay the players at all and this is something Franz (Tabone, MFA integrity officer) and I are in complete agreement with. Hill described his discussion with the top Asian fixer, whom he called Chin Lee, as “the most extraordinary conversation I have ever had”. “Part of the issue was that every syllable of what he said I found out later were true,” Hill observed. “We met in a private golf course, there were very good-looking women in the room, a couple of his aides around. He had four telephones and he was just fixing games right there, including one in the Bundesliga. “And I was like, after an hour and so, I said ‘What’s the biggest game you have ever fixed? He said… ‘I don’t know, what’s bigger the Olympics or the World Cup’. It has long been acknowledged that the most notorious match-fixing syndicates are based in Asia. “We have to say that Singapore, Malaysia, Thailand and Indonesia… these people are coming to Malta, they’re coming to Greece, they’re coming to all the countries around the world, including Canada, and they’re fixing our sport,” Hill said. “(The message should be) It’s your problem and you guys have to take this seriously, if you don’t arrest your guys and put them on trial or extradite them to our countries, you are not part of this international sporting movement and frankly, who would care. 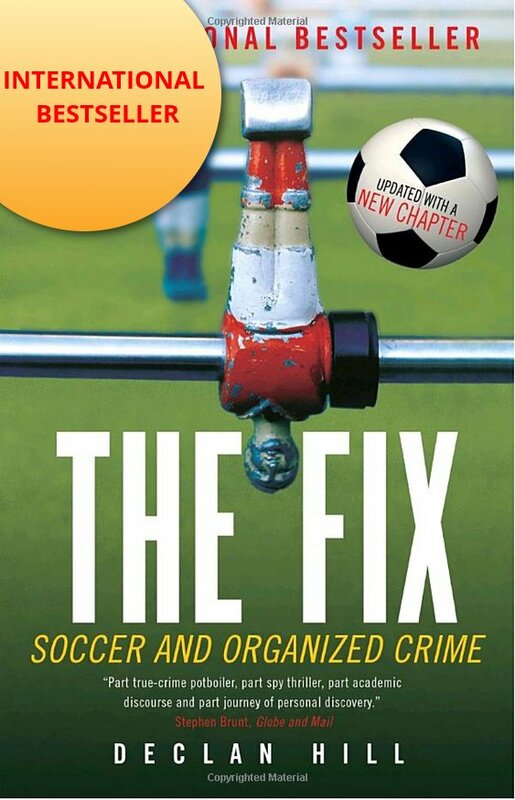 “Like if Singapore and Malaysia, where most of the fixers are, were thrown out of the international Olympic movement and thrown out of FIFA, would we care? Their teams are not very good, their sports aren’t very good. “Why? Because corruption has ruined it but they are exporting their football fixing around the world. “I will give you an example…I remember in 1985, after the Heysel Stadium disaster in Brussels where UEFA said to England… ‘No disrespect, but your people are coming to our countries and they are killing our people, so we’re not going to allow you in football for the next five years, you have to clean it up. “And fair play to the English, they cleaned it up. Now, does football hooliganism still go? Yes, it goes on but much, much less than before. “The same thing needs to be done to these four Asian countries, Singapore, Malaysia, Thailand and Indonesia. “Their people are coming to your country. They set up with Ante Sapina the fix of your national team.